Dana Alsamsam is a queer, Syrian-American poet from Chicago and an MFA candidate and writing instructor at Emerson College. She is the Editor-in-Chief of Redivider and senior editorial assistant at Ploughshares. 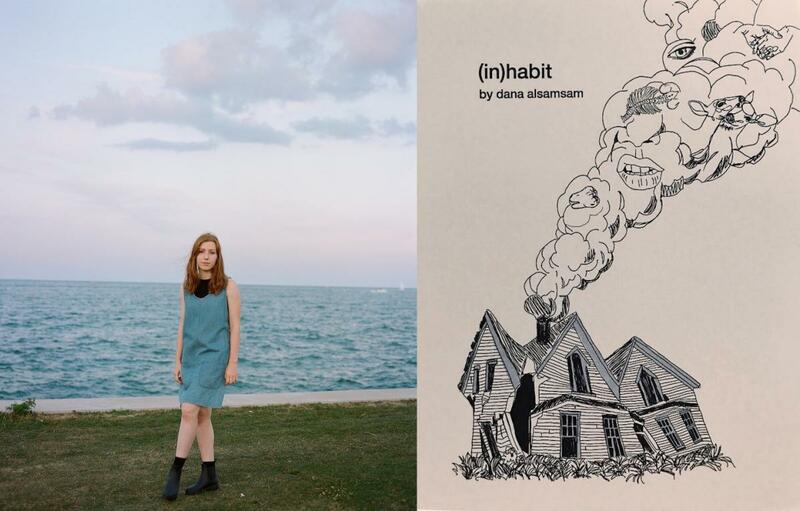 Dana’s chapbook (in)habit is available from tenderness, lit and her poems are published or forthcoming in Salamander, North American Review, The Massachusetts Review, Fugue, Cosmonauts Avenue, Tinderbox Poetry, BOOTH, Gigantic Sequins, The Boiler Journal, Bone Bouquet, and others. Critical work appears in The Rumpus. Dana was a Lambda Literary Poetry Fellow in the 2018 Writer’s Retreat for Emerging LGBTQ Voices. Jon Riccio: I enjoyed your collection, Dana—so happy tenderness, lit provided a home for the gemstone that is your work. The titled parentheticals of (in)habit create a loupe through which readers parse gender and geography alike, not to mention that “maps grafted / onto her palms to make her way / the hell away from heaven” has my vote for Siri direction of the decade. Why are parentheses so vital to your aesthetic? Dana Alsamsam: The poems in the collection can often be located in liminality or a feeling of transition—in-between-ness. The physical locations are suburban and often domestic. In these spaces, femininity, queerness, difference, or just plain emotion in general have to be hidden to stay safe and sane. The parenthetical to me is a whisper. It functions as protection for the secret inside it. The parenthetical says, this is what the speaker tucks into bed with her at night but might never say aloud. The parenthetical in this collection also offers double meanings. For instance, the title can be read as the full verb, to inhabit, or it can be read as completing something routinely, in habit. These doublings are intentional throughout. JR: The halfway point of your opening prose poem “(inhalations)” tells us, “All of me is in all of me” transitioning to “this layered pattern of becoming which has composed my body—a loved thing, a hated thing, a female thing, a breathing thing, a battered thing, a living thing.” Are biology, pathos, and brutality the triangulation for womanhood? In which angle are the stakes of queerness highest? JR: “The Shapes We Make” has the wonderful “You look up at me, stories still cathecting / behind your teeth” which assigns a luxurious task to a part of the body we don’t normally associate with duties beyond brushing and chewing. Is the mouth a library or librarian of narrative? DA: I’m shy and don’t speak much if I’m not prompted to do so. Despite this, I’ve always found that I have my best and clearest thoughts and ideas when I am able to articulate them and speak to someone about them. The people that I love become a sort of soundboard in these situations, whether it be thinking through a poem or making a difficult life decision. Speech and conversation, especially creative and intellectual conversation, are also an important part of romance for me. So it felt natural to place luxury and narrative behind the loved one’s teeth in this piece. but the bright knobs of a transistor radio. The speaker expresses a desire “to switch off like a television,” a lulling of conscientiousness, perhaps? How does media coexist with a writer’s interior? DA: I hate the phrase “now more than ever” but . . . now more than ever marginalized writers are acknowledging the power of rhetoric on social media and speaking up, writing, and fighting for their marginalized siblings. We spend a lot of time doing this emotional labor because we know it’s important but it’s also exhausting. In another sense, writers who are actively submitting and publishing have this anxiety surrounding the literary publishing scene and the pressures that come with it, especially a fear of rejection or the impending doom of never being good enough. As a neuro-atypical writer, this all becomes overwhelming and perpetuates cycles of anxiety and depression. The move in this poem from a television to the image of a transistor radio at the end is symbolic of some false hope of a return to simplicity. The “bright” knobs serve as more obvious, simple solutions than the static of today. It’s a false hope and an impossible hope but in this poem the speaker is . . . well . . . tired. JR: “(dis)sociate” features a trio of speakers, Lover, Spoken Voice, and Inner dialogue who offers, for me, the most romantically charged lines in the book, “I am not / even adequate for your unbuttoning.” Was this scripted with three participants from the outset? What are the advantages to writing single poems in a polyvocal format? DA: This piece began as a monologue by a lover with brief interjections by the loved. I realized that the primary tension in the piece was that the lover’s monologue could never actually be spoken—something holds them back from saying these things. Their intensity makes them feel “crazy” and words are never enough to express it anyways. By making it an inner dialogue, I acknowledge the uselessness of language and the jostling anxiety of articulating love. The lover then becomes two completely separate voices. I think the primary advantage is the interesting tension between self and self. JR: With its epigraph by Boris Pasternak, “Studio B, Vaganova Academy, Leningrad, February 1961” reveals the saga of a dancer whose body faces intense scrutiny at all of ten-years-old. She wants the labels prima, swan, and nymph, yet cannot bring herself to a state of acknowledgement: “I’ll put on my favorite tutu / and I will not look in the mirror.” It’s such lines as these where (in)habit uses the artisan to combat the blighting of the female self. From which creative and critical texts do you draw empowerment? DA: I read a lot of queer, feminist cultural critique like Rebecca Solnit and Roxane Gay, and fundamental feminist texts like bell hooks and Audre Lorde. These texts aid in the work of effective articulation of the theories and issues that affect me and my discourse communities. I feel most powerful when I have the power of language behind my ideas. With creative texts it’s pretty simple. I’m empowered by marginalized folks existing and flourishing and making art. I draw particular empowerment from queer nonmen, Arab and Arab American writers, and children of immigrants. JR: The second section begins with “(exhalations),” clarity attained at a cost—“Excavation is a fundamentally destructive process—you / pull out the prize, the answer, the origin story but destroy / the land around it.” One may take an ecocritical view of this passage, but I’m more curious as to how ruination in the service of personal knowledge relates to (in)habitance. DA: I think to comfortably inhabit my “self,” I had to acknowledge the parts, or the various influences, that created this volatile, shimmering thing that is me. A lot of those influences, though, were damaging people or events that I had suppressed, blocked out, or denied due to mental illness. It got to a point where I couldn’t understand why I am the way I am, and especially why I did certain damaging things to myself and others. To get to those things in order to understand myself, I had to do a lot of painful mining. It sounds cliché, but I had to break down the walls that had been protecting me. JR: You explore mother-daughter silences in “Dawn-turned.” Set on a Sunday morning, images of coffee and terry-cloth precede “the cavity of everything / a mother should say but doesn’t.” What do poets need to bear in mind as harvesters of the unspoken? DA: I write a lot about my family and our personal tragedies and traumas. A lot of times, the things I write about I’ve never spoken to my family about. In Arab immigrant families, based on my own experience and anecdotes from close friends and family, affection and sharing personal troubles is not encouraged. Parents are parents, not friends, and they’re often extremely tough on their children because they want them to succeed. I’ve never told my parents how I shouldered and continue to shoulder this burden. I always have to be careful that I’m telling my story, my history, without portraying my loved ones unfairly. On the other hand, I have to ensure that I’m not censoring myself. They hurt me and that hurt is worthy of art and space on a page. JR: (in)habit was a chapbook contest winner at tenderness, lit which launched less than two years ago. It must have been exciting to work with a newer press “that exists to uplift the voices of LGBTPOC writers.” How do you see the collection in dialogue with the books of your tenderness, lit cohorts? DA: Yes, I love my press. They care about their authors as full people and as a community, not just as their work. Working with a small press that shares a lot of my values feels like grassroots work to me. It’s a treat to lift up the press as they lift me up—queer voices supporting queer voices. With my press mates, I’ve noticed a trend that many of us are concerned with what it means to live inside of our bodies. JR: You wrote a magnanimous review of Jenny George’s The Dream of Reason for The Rumpus, noting that her poems “are a patient and curious face staring straight into the violence of the speaker’s surroundings—what she finds there and what is hidden just beyond view.” It’s great seeing you in a literary stewardship role. What takeaways from book reviewing strengthen your poetry? DA: I love writing reviews. I spend so much time admiring and pulling inspiration from the work of others. Reviewing forces me to look closer and articulate the inner machinations of the brilliant work of others. I think of myself as a student reporting on the work of experts. Jenny George’s collection in particular taught me a lot about how to craft and order a manuscript as a whole to establish and then complicate ideas. JR: The final we of (in)habit end “in charred hands, / pulling the ash from each other’s hair.” Which has a more compelling backstory—keratin or fire? DA: Recently, I was in a real fire, so I’m going to say keratin wins this battle. Fire grows endlessly, carelessly. Keratin is more meticulous. Jon Riccio is a PhD candidate at the University of Southern Mississippi’s Center for Writers where he serves as an associate editor at Mississippi Review. Forthcoming poems appear in Gravel, Manzano Mountain Review, SurVision Magazine, and Word For/ Word. A 2018 Lambda Literary Poetry Fellow, he received his MFA from the University of Arizona. In Tucson he was a digital projects intern for the Poetry Center.